﻿ Barstool from scaffold tubes and reclaimed wood, free construction plans. Free construction drawings and assembly instructions to make bars stools and matching tables. 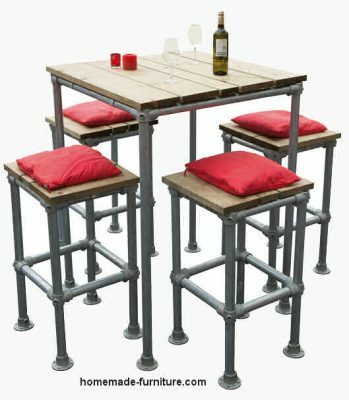 Build a barstool with reclaimed scaffolding tubes and boards. Barstool from scaffold tubes and reclaimed wood, free construction plans. 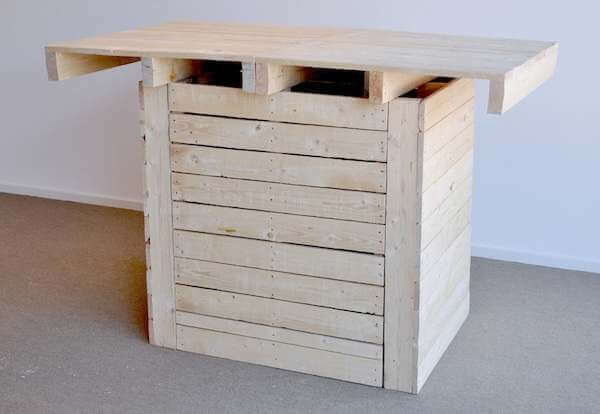 Free furniture plans » DIY example to make a barstool from recycled materials. » Construction drawings for barstool and matching bar table. Sturdy construction makes these barstools and matching tables weatherproof and long lasting. The assembly is as easy as any flatpack furniture that you might buy in a furniture shop. Nevertheless you will still have to cut some planks and metal tubes. Furthermore the assembly of this scaffold furniture is a piece of cake. Construction drawing for bar stools and matching tables. Parts list to make a high table. The top consists of 2 or more Scaffolding boards. Any wood will do, but we prefer the use of reclaimed planks. These are connected with another short plank below the tabletop. Four tubes for the table legs. We advise a height of 110cm. for these table legs. Use shorter tubes if you want to make a dining table. Four tubes, each with a length as your desired table size. We suggest to use tubes of 80 or 90 cms. Another shape for these tables could be stretched rectangular. For tables of 80x120cms it is wise to add extra support between the table legs. The woodworking plans for a farmhouse table show another method to connect table legs. 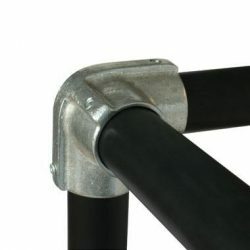 You can add four through corner elbow pieces to connect extra tubes as with the barstool footrests. Plus 4 half open straps to connect the tabletop to the tubes. Furthermore you need 4 base plates or plastic stops for each table. The plastic tube endings prevent scratches from the table legs. For the top of this table frame you will need four corner knee pieces. 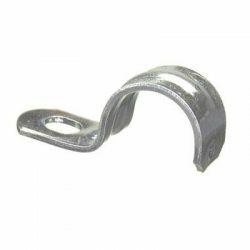 These three way elbows are like all other connectors available in bare metal and a limited range of colors. Parts list to make a barstool. Use repurposed scaffolding tubes and reclaimed wood wherever possible. Two planks and a slat to connect these to make a seat for the barstool. Four tubes with a length of 80 cms. for the legs of the barstool. In total eight shorter tubes, each 40 cms. long. Four of these are the connecting tubes between the barstool legs, below the seath. The other four tubes will enforce the stool and serve as footrests. Four halfopen pipe straps to attach the stool seat. Furthermore either four metal footplates or plastic stops. Plus four 3-way corner pieces. And finally four through corner elbow pieces for the barstool footrests. 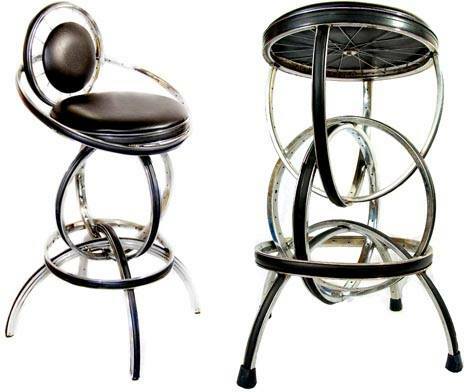 Very nice, barstools made from bicycle parts. Similar woodworking plans and diy instructions for scaffolding tubes. 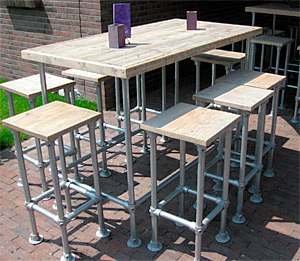 These barstools fit very well together with a homemade bar table from pallets. These woodworking instructions and building plans are derived from our Dutch site for homemade furniture. More furniture that you can make with scaffolding tubes and repurposed wood.